In the meantime, a low level drug dealer has taken over The Count’s operation, and has a new version of Vertigo. This mix brings out the user’s greatest fear. Not sure how this is something a drug user would want, but nonetheless it adds to the story later on. This new leader (Werner Zytle), plants a tracking device on Arrow, and he is tracked to the restaurant he is having dinner with Felicity at. Zytle (now known as Vertigo) fires a missile into the restaurant. There are deaths, but Oliver escapes with Felicity. This reminds Oliver that he can’t be “normal” while also trying to be The Arrow, and his feelings for Felicity affected his judgment. The team is able to find Vertigo’s hideout, and when Arrow arrives, Quentin is already there. Quentin is not supposed to be out on the beat, which will be stressed shortly when he has what appears to be another heart attack. But before that, Vertigo injects Arrow with the new vertigo drug, and Oliver sees his greatest fear – himself. Deep, right? Arrow manages to shoot Vertigo with an arrow and get help for Quentin. Quentin had a coronary spasm, and is resting in the hospital. Laurel visits him, and can’t understand why he won’t listen to the doctors. Quentin has been a cop since before Laurel and Sarah were born, he doesn’t know what he is if he isn’t a cop. Laurel tells him he’s a father. While working at the tech shop, Felicity encounters a customer who is also into hacking. She helps him out by giving him some tips and even a URL to a site that she uses. Seemed kind of stupid of her to just tell this random guy all about her hacking. At the time I just figured she was going to fall in love with him and Oliver would be sad (i.e. that one episode that Barry Allen was on). He even tells her that he knows someone who would want to hire a person with her skills. She politefully declines, and he is on his way. Fast forward to the Board meeting where Oliver is going to try and sweet talk them into letting him buy the company back. As it turns out, there is another bidder, a man named Ray Palmer. And lo and behold, it’s the guy that Felicity helped at the store. He hacked into Queen Consolidated’s computers to get their very low financial numbers. Palmer is a rich, suave guy, and the Board loves him. Oliver decides that it’s better he didn’t get the company back, now that there are new threats to Starling City. He tells Felicity about seeing himself when he was on vertigo, saying that he’s scared of what might happen if he becomes just Oliver Queen. The team figures out that Vertigo is trying to take out the other crime bosses in town, and based on their ankle bracelets, Felicity is able to track the three biggest to a boxing match at the big arena. Oliver tells Diggle that he can’t go on this one because he’s going to be a father. They argue, and Oliver says it’s his crusade so he makes the rules. Diggle leaves, and we can see Felicity crying at her desk. Roy and Oliver are at the arena. Vertigo has setup a bomb that will go off in five minutes. Roy goes after the bomb, and Oliver goes after Vertigo. Roy finds the bomb, but Felicity is unable to help him defuse it. Instead, she has him break a Freon pipe from the air conditioning and use it to freeze the bomb. It works, with a generous one second to spare. They didn’t really explore what might happen if the bomb thawed out. Oliver is fighting Vertigo, and this time when he is injected with the drug, he is able to shake off his fear, and Vertigo is just Vertigo again. Sarah shows up out of nowhere to help Oliver, and they are able to capture Vertigo. 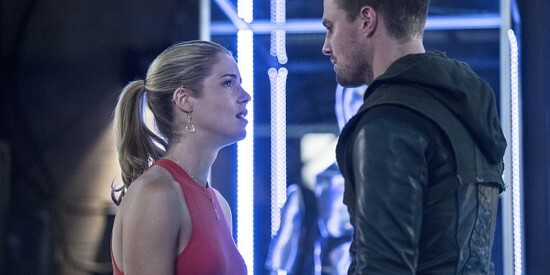 She tells Oliver that they wear the mask, and they need people in their lives that don’t wear masks. Felicity and Oliver visit Diggle and Lyla in the hospital. Lyla had the baby, and Diggle apologizes to Oliver, telling him he was right. Oliver needs to talk to Felicity. This has been building ever since the restaurant was bombed. Oliver still can’t be both The Arrow and Oliver Queen, not right now, and maybe not ever. Felicity tells him to stop dangling babies (at least I think that’s what she said), and to just tell her never in that case. She asks if he even actually loved her. Oliver kisses her and tells her to never ask him to say he doesn’t love her. Felicity walks away. Should be a fun day at the office tomorrow. Barry Allen calls Oliver and says he needs to meet with him (cue clip from end of Flash episode one, though they didn’t actually show it). Laurel and Sarah meet on a rooftop. Sarah doesn’t want Quentin to know she’s back right away, as she’s back on business. Laurel gets called to the office, and as she’s walking down an alley, Sarah is shot with three arrows and falls off the roof of the building, smashing into a dumpster right next to Laurel. So Sarah is dead, and I guess the imposter Arrow is back? There were few flashbacks in this episode, but they focused on Oliver’s time in Hong Kong. He keeps trying to escape from Amanda Waller, but is always recaptured by Maseo. Oliver tells Amanda he will never work for her, and would rather die. Amanda comes up with a new plan, Oliver is now staying with Maseo and his family. Maseo is in charge of Oliver now. If Oliver escapes, Amanda will have Maseo’s family killed.